Five days before the election I wrote a post about what a Donald Trump presidency could do to the ongoing struggle for equality in the digital space. Read the November 3 Post-Trump Digital A11y Update. I wrote from my heart and from a place of fear. Fear of how a Trump presidency could turn back the clock on disability civil rights. Fear about the impending threat to two decades of forward movement to include disabled people in everything the digital world has to offer. I wrote that piece to sound the alarm bell before it was too late. As a lawyer who speaks and writes about digital accessibility law I felt a strong responsibility to spell out how just what could happen to the courts, the federal agencies and the legal strategies that have contributed to accessibility achievements. But now the unthinkable has come to pass. While I am despondent over the election, and still believe what I wrote on November 3, I realize it was only half the story. Now I feel a new responsibility: to remind us all that digital accessibility is here to stay. That despite obstacles the new administration will throw in the path of progress, disabled people will continue to insist on their civil rights. And the law, possibly battered and bruised, or temporarily in retreat, will be there to help. As Martin Luther King said in another dark time, “The arc of the moral universe is long but it bends toward justice.” I couple that with a quote from Helen Keller that I reference in my book: “Nothing can be done without hope and confidence.” Together, we will use every tool available to preserve hard won gains toward accessibility. In my pre-election post I lamented potential threats to core federal civil rights. But I failed to mention that many states also have laws that protect the rights of disabled people to digital accessibility. From state constitutions to local ordinances, there are non-federal protections of the civil rights of all citizens. Most states have “little 508s,” that require state agencies to procure accessible technology. And many states have civil rights laws that parallel the Americans with Disabilities Act, or even go further. The landmark web accessibility case against Target stores (a company that since has become an accessibility advocate) was based on California civil rights law. These state laws will be available to advocates no matter what happens on the federal level. Just as states have laws unaffected by Congress, so too do states have appointed officials who can carry the torch of accessibility. The Attorney General of Massachusetts Maura Healey has been a digital accessibility champion for many years. Healy’s office should serve as a model for other attorneys general around the country. Most recently, Maura Healey’s office and the National Federation of the Blind announced a landmark agreement to make health care kiosks accessible to blind consumers. The announcement was but one of several collaborations between Massachusetts’s top lawyer and the NFB. Other efforts that have advanced accessibility include the 2013 agreement on web and mobile accessibility with Monster, Inc.
Last year the Bay State’s AG formed a disability rights advisory committee to “protect civil rights of all Massachusetts residents.” Other state law officials should follow suit. The federal government might not be interested in civil rights, but many state governments will be. The new administration has a long-list of destructive promises to attend to – or abandon in the face of actual governing. Messing with current disability rights laws will be low on the agenda, if on the agenda at all. And while my concern over federal agency appointments remains real, the laws will exist for private enforcement even if our inside champions are gone or limited. I was reminded since writing the post that many agency enforcers are civil servants who cannot be fired by a new administration. Whether these workers will have the freedom to work behind the scenes, at least in some capacity, on issues we care about remains to be seen. But the ADA and other federal protections are there for disabled people and their advocates. We may be using them in different ways, but we will be using them. In my pre-election post I worried about judges appointed by a far-right republican president and republican-controlled congress. And I’m still worried. But those judges will only fill vacancies. In the United States sitting judges do not lose their seats with a change in political power. Sitting judges will be joined by Trump-appointees, and there is good reason to fear the new-comers. But they will be joining judges who have recognized disability civil rights and who will be around for many years to come. The Americans with Disabilities Act was passed because disabled people took to the streets to demand their rights. Chained themselves to busses demanding transportation, filled the halls of congress with stories of exclusion and a thirst for independence. Today, 26 after passage of the ADA, the disabled community is stronger than ever, with more grassroots organizations and social media skills to mobilize resistance against legal rollbacks. Disability rights lawyers are ready too. Ten years ago I was privileged to be on the founding steering committee of the Disability Rights Bar Association. Today we have a thriving national organization of committed lawyers dedicated to protecting and advancing disability civil rights in all its manifestations, including digital access. We share strategies, support each other’s work, and share a deep resolve to be strong and vigilant in the coming period. When I think about Structured Negotiation success stories I think of companies that needed a push, but then embraced accessibility to become leaders in their fields. Organizations like Major League Baseball, Bank of America, E*Trade and many others. These organizations have developed accessibility infrastructures and have seen the benefits. Accessibility remains in place long after the lawyers have left the room. Among those benefits? Satisfied customers, content that is easier to read for everyone, improved search engine optimization. And their accessibility commitments have wide ripple effects, as vendors are forced to deliver accessible products, as web developers and usability professionals learn new skills that won’t go away. In the United States there is no denying that the law has been a driver of accessibility. But it certainly has not been the only one. In the post-Trump era, the law will still be there, as I hope this post has shown. But the other drivers will be there too. And the thousands of people inside and outside corporate and government organizations who have made accessibility their calling card? They are not going anywhere either. Web designers and developers, #a11y camp and MeetUp organizers and participants, access consultants, usability testers, project managers and so many in other roles have embraced accessibility and created a community of practitioners that can withstand a political tsunami. As a lawyer I write about the law, but let’s not over-emphasize its role in the trenches of accessibility. As the excellent Web Accessibility Initiative video series makes clear, accessibility, while essential for disabled people, benefits everyone. That truth cannot be taken away no matter who the president is. Honestly, although this is a post of “hope and confidence,” I do not think we will see web regulations in the next 4 years. And any regulations that somehow are in play would not be be shaped with a civil rights perspective. Still, a business push for clarity might protect the issue of web accessibility generally from the hatchet that is coming to civil rights. Structured Negotiation is a way of resolving legal disputes without lawsuits, runaway expenses and conflict. It offers the opportunity to build relationships and foster understanding, leading to win-win solutions of even complex issues. As I wrote in my pre-election post, Structured Negotiation exists to resolve legal claims; weakened federal ADA claims makes Structured Negotiation harder. But writing this post has made me realize two things. First, many of the principles detailed in my Structured Negotiation book are applicable beyond resolving a legal dispute. Our experience in writing initial letters that engage – not alienate –has applicability anytime one seeks to open dialogue with a potential adversary. My checklist for successful meetings when there are no court rules imposing order is relevant whenever people get together to resolve disputes. Lessons about appreciating small steps toward larger goals and working with a negotiator’s fear may prove particularly relevant in the coming period. Second, as I hope this post has shown, legal claims are not disappearing overnight, not ever. Disabled people’s right — and the historic impulse — to vote confidentially online, view financial information privately, and fill out your own medical forms is not going away. And in this new dawn of too much conflict and hate, Structured Negotiation offers a refreshing alternative. Actually talking to people, sorting out issues, establishing common ground. On Tuesday November 15 I will be speaking about my book at Harvard Law School. One week after the train wreck of the election I have been struggling with how to do that. Then I remembered a line I wrote in the final chapter. Mediators often call themselves peacemakers, but I’ve never been a neutral and never saw the word as fitting me. Writing forced deep introspection, though, and I wrote this: “In two decades of avoiding the courthouse I have learned that bringing peace and being a strong advocate are not mutually exclusive. To the contrary, being a peacemaker serves the advocate’s goals just as it serves the mediator’s.” As I say (many times) in the book, Structured Negotiation is but one legal strategy in the advocate’s tool box. In the next (may it be short-lived) period, we’re going to need every strategy available. I’m glad Structured Negotiation is one of them. I illustrated my pre-election post with an image of a man about to toss his computer into a reed-studded lake at sunset. It symbolized to me the risk of losing all the law has achieved to make the digital space available to everyone. But the man in the photo hadn’t thrown it yet. His arms were drawn back for the toss, but he hadn’t let go. This post is illustrated with the sun rising over that lake. I chose this image to reflect the theme of this post: The man might have made the toss, but the sun is rising and hope is not lost. 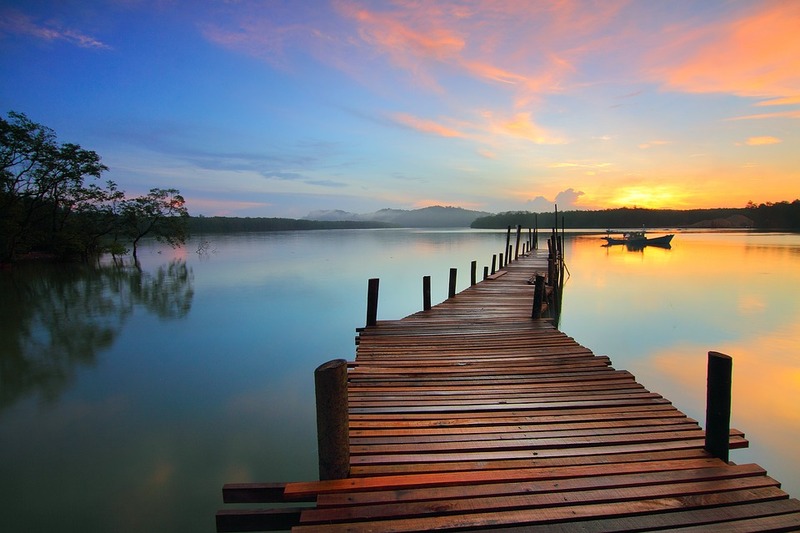 The image includes a long dock leading out into the lake to symbolize that the road to that rising sun is going to be long. And it is not going to be easy. But even though I do not feel it at the time of this writing, I am sticking with Helen Keller – Nothing can be done without hope and confidence. And a lot of work. Let’s go do it. This is a post about digital access after the 2016 election for president. In an earlier post I wrote about the threat to digital civil rights if Trump were elected. Here I write that digital access is here to stay. Disabled people will insist on access to the accessible content. State laws will not change. State agencies can protect disabled people’s rights. Even though there will be new judges, existing judges will still be here. The disability community is strong. Activists and their lawyers will work to protect rights. Companies and government agencies see the value of access.